Fancy a home with some stylish and geeky home improvements? OK, you've got the geek gear. You've got the geek garb. But have you got the geek house? Read on as GeekTech shows you how to make your home into something friends would be envious of, using cool DIY projects or hacks. Most coffee tables are merely functional, but the Rainbowduino is a conversation piece. The table itself is made from wood, but the grid in side just cardboard slotted together. 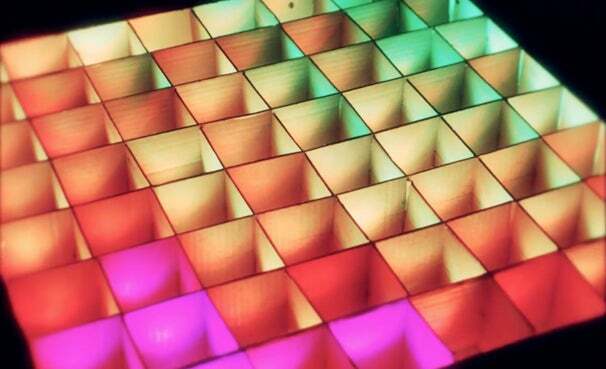 In each of the cardboard squares is an LED that is capable of changing into various colors. The individual LEDs are controlled by an Arduino microcontroller. Add in a 64Pixelmatrix, and you have a coffee table that's not only pretty to look at, but capable of mini light shows. If you want extra workspace or storage in the kitchen without making the room too cramped, make an island that disappears into the floor. Web developer Tim Thaler used a hydraulic scissor lift to get the cabinet moving up and down. When down, the island simply lowers into a utility room. Tim uses an iPhone app to control his hydraulic island: Once the island is fully up or down, the app cuts the power to the lift. Sadly, the necessary equipment doesn't come cheap, so you might want to do a little eBay shopping. Check out the video of the cabinet in action. If you happen to have a pantry in your house and know a little about circuits, this very straightforward hack may be for you. The DIY pantry light, by Gina Trapani’s father-in-law, was made using a watch holder and rope lights. By attaching the switch just so, the light switches off as you close the door, which prevents wasted electricity. Check out Gina's image gallery on Flickr. If the rainbowduino coffee table wasn't quirky enough for you, how about a dimming propeller lamp made out of trash cans? 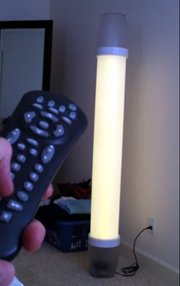 The long LED lamp is made out of two trash cans and a sheet of PVC, and it you can adjust the brightness using a Sony remote control. Parallax Forums has the details. More a potential product than a hack, the Android-powered Farmbox lets you grow and manage your garden with a tap of an app. Once hooked up to your phone, Farmbox will automatically make sure your plants or vegetables get enough water, light, temperature and nutrients needed to grow nicely. What's more, data about your plants is uploaded to a cloud service, so you can record how to successfully recreate it again, or pass on to impressed friends.. There's nothing more irritating than having to go out in the rain or cold just to check your snail mailbox, only to find there's nothing there. Argh! Why not wire up your house to tell you when the mail has arrived instead? 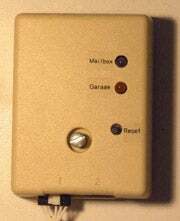 Household Informer can do more than let you know when you have mail: this hack is based around an AVR chip and has particular sensors for each function you want it to perform(you can set it up to open your garage door, for example). See the Instructables page for info on how to set up the useful system. Forget to fill up the cat's water bowl and wish Kitty could fill his own bowl? Although the latter may not happen for some time, this hack not only fills up the cat's bowl automatically, but also tracks the cat's water usage, so no wasting water. The hacked device is attached to a water tap, and controlled by a sensor and data logging on Linux via Xbee and MongoDB. The tap will sense when it is being used, and communicates with the PC, which then determines if it was the cat waiting for water or a human (a false positive on the data). This will then produce the right amount of water, when the cat wants it (well, most of the time, anyway). Follow the instructions to work it out for yourself, but be patient--it may take a while to complete. Coffee's great; having to make it is not. Enter Tweet-A-Pot: With the help of an Ardunio board, a Twitter account (and a custom hashtag), and a little Python coding know-how you can get your coffee machine pouring your beverage with only a tweet. That's a bit of time saved in the morning rush before work, or when entertaining friends. Bring the club to your own living room with lasers and Kinect. This hack, created by Matt Davis, uses body movements to control the music and light show. To get music tracks flowing together nicely, the hack uses an OpenNI interface with Max/MSP (a visual programming language) and Ableton Live (a music sequencer). Watch Matt's explanatory video for the full details on how to bring the fun to your house. Think there are more cool geeky home improvements missing off the list? Add them in the comments!